The situation on global sea-level rise due to climate change seems to be slowly becoming clearer. At the time of the fourth IPCC assessment report (AR4 in 2007) there was a big controversy over the numbers cited there. The problem was that those numbers ignored ice-dynamics (the fact that the big ice-sheets on Greenland and Antarctica might start to break up at the edges and slide rapidly into the ocean, rather than just slowly erode in place). It had become clear in the 2000s that ice sheets were much more dynamic than had been previously assumed and in particular, water was pouring down channels (moulins) in the ice to the base and lubricating their movement in the summer - glaciers were accelerating unexpectedly. This process was not well understood quantitatively, but appeared likely to be the most important mechanism by which ice sheets broke up (and in turn, a major contributor to sea level rise). What the IPCC elected to do was present numbers that explicitly excluded the ice dynamics contribution, which struck me as a poor decision at the time. In a summary publication of that kind, intended for the public and policymakers, it seems to me that if you can't quantify the most important effect, it would be better to admit ignorance and not to present numbers at all, rather than present numbers for the second and third order effects that you believe you can quantify, but which are bound to be badly wrong as a summary of the overall situation. In the interim, satisfactory ice dynamics models based on the fundamental physics are still not available, and more empirical methods are coming to the fore. The latest paper on this is Vermeer and Rahmstorf in Proceedings of the National Academy of Science (there is also an interesting account of the genesis of this work at RealClimate). The paper is pretty impressive, at least to this non-specialist. It's an easy read - a hazy memory of your undergraduate calculus course will get you through if you are otherwise quantitatively literate - and the results, for what is a very simple model, are intriguing. The basic idea is to model the rise in sea level as being governed by two terms. The first term says that there is a contribution to the rate of rise in sea level that is proportional to the difference between the current global temperature, and some reference temperature T0. The idea is that the sea level is eventually - in millenia - going to be a lot higher, but the rate at which it starts to go towards that higher value is proportional to how much above pre-industrial temperatures we are. The second term basically assumes that there is a contribution to sea level itself that is directly proportional to temperature (that some aspects of the ocean expand immediately in response to temperature expansion). There is a substantial plot twist in the paper around this term, but I will let you go read it if you are curious. In any case, they take this simple three parameter model, and use a fit to global temperature and sea level from 1880-2000 to estimate the parameters. I have added the emphasis on 2000 as the end date of their fit - we will come back to that point later. Here the thin wavy red line is the annual sea level data, the thicker red line is a smoothed version of it, and the dark blue line is the result of their model. So the point is that the thick red line and the dark blue line are almost exactly on top of one another - a very simple model is clearly capturing a great deal of what is going on. In any multi-parameter model, there is always the danger of overfitting - if you throw enough parameters into the model, you will get it to fit the data, but it will be fitting the noise as much as the real signal, and the symptom of this will be that when you try to use it to predict outside the interval on which you fit, it will fall apart and predict something crazy. To assess this, they show in the pale blue and the pale green lines what happens when you fit to the first half of the data only, and the second half only. As you can see, the resulting predictions would not have been perfect - they are off by maybe 10% of the total change in the interval, but they are much better than useless - you would have been in the ballpark of what actually happened (giving one some hope that predictions going forward into the 21st century might also get you into the ballpark). 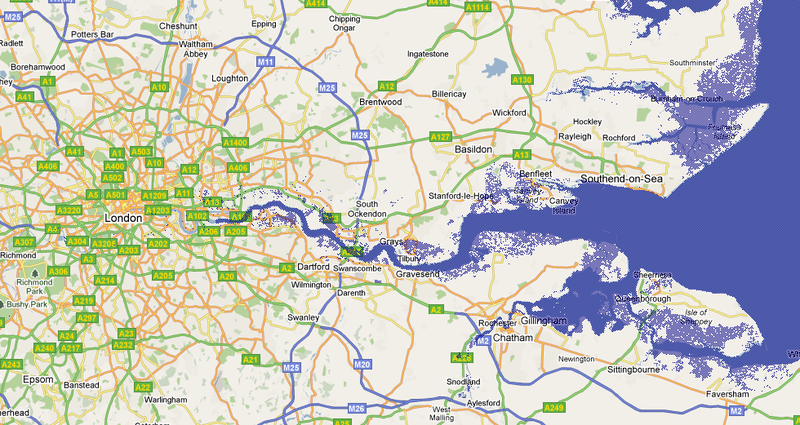 The reason is that sea-level is kind of a doubly integrated quantity. The temperature change itself integrates over carbon emissions, and the sea level integrates over the temperature change. So that means there are huge lags between what you do, and when the full effect shows up (it's not that different emissions levels won't make a huge difference to sea level in the long term - they will, just that the full effect of the difference will take hundreds of years to show up). 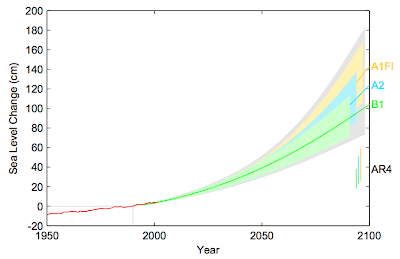 So this model says to expect, ballpark, 1-2m of sea level rise over the course of the twenty-first century. This is likely to be very painful regionally, but hardly catastrophic globally. As you can see, we lose a bunch of farmland in the Sacramento river delta, and various low lying regions around the San Francisco Bay, but the main cities are for the most part going to still be above water. Decisions are going to have to be made about what is to be protected by levees, and what is to be abandoned to the sea. But it's not like the ability of Silicon Valley to design technology products is seriously threatened by this, nor the ability of financial firms to operate in the financial district of San Francisco. 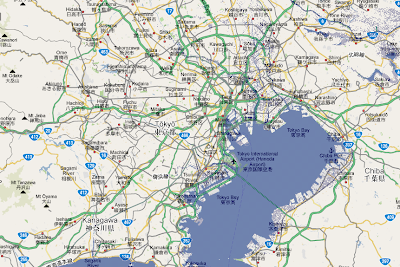 Tokyo is definitely not pretty - they are going to have to build a lot of levees, and Japan is earthquake prone. So, in terms of the four factor model I discussed the other day, this is a stressor: there's no way this alone would cause a collapse of global civilization by itself, but it is certainly going to be another substantial ongoing stressor. In addition, highly nonlinear responses of ice flow may become increasingly important during the 21st century. These are likely to make our linear approach an underestimate. Therefore, we have to entertain the possibility that sea level could rise faster still than suggested by the simple projection based on Eq 2. To get a feeling for this, here are the best recent estimates I'm aware of for the surface mass balance of the Greenland ice sheet, (from van den Broeke et al in Science last November). The blue curve shows the change in the mass of the ice sheet, and the orange curve is runoff due to melting. Although it's perhaps too soon to say for sure how much of this to attribute to natural variability, the orange curve certainly raises the possibility of a pretty non-linear response in which some threshold has been crossed and now the situation is accelerating rapidly. Note that this has largely occurred since 2000, and thus wouldn't be taken account of in Vermeer and Rahmstorf's model fit (which was only to data through 2000, but in any case, it's going to take significantly longer before there's enough data to really tell what that means). There was a fairly recent report about direct evidence for historic sea level conditions in Mediterranean coastal sea caves. This suggests that sea level changes can be more rapid. "In coastal caves on the Spanish island of Mallorca in the Mediterranean Sea, the team studied stalactites encrusted with calcite. They measured the elevation of those encrustations, which were deposited like bathtub rings that mark high- and low-water levels, and then dated those deposits using the radioactive decay of traces of uranium into thorium isotopes. Based on those calculations, the researchers found that sea level 80,000 years ago had rebounded to the point where it rose 1 meter higher than it is today. And it could have risen quite quickly, as much as 2 meters per century, says geochemist and lead author Jeffrey Dorale of the University of Iowa, Iowa City." 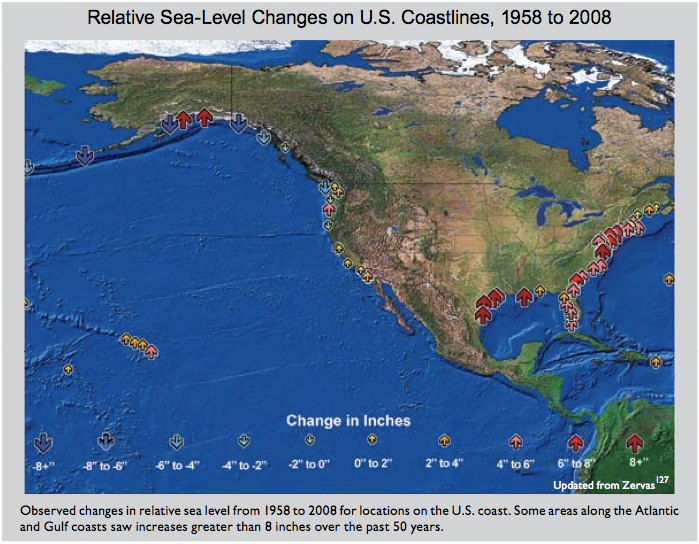 I have lived at sea level since 1966. Have been warned and concerned most of that time. The worst years for damage or destruction of property in this area were 1967 and 1983. . The tides vary and were unusually high as I recall in the 1990's. Fortunately there were no Pacific storms concurrent with the high tides of that period. We haven't had any problems recently. Who knows if the next earthquake will bring a tsunami. 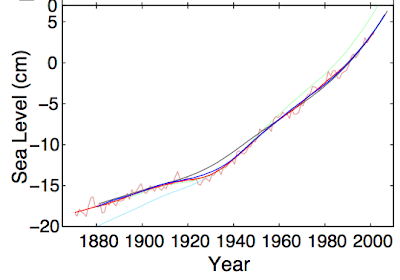 Robert - since 1966, there's been ballpark 10cm of global sea level rise. However, most places on the West Coast have been partially protected by the fact that the coast here is generally rising. On the East coast the coast is generally falling, so impacts will be greater there. See here (big PDF) p 37 for a summary. Actually, I'll just put the key map up in the post. Gary - yes I read the Science paper at the time. It seems the science on the history of sea level rise during the last ice age is kind of unsettled still - probably best for bystanders to wait until the various dueling groups can agree on what happened. From 1959 to 1961 I was stationed at a medical facility in Norfolk VA and shared waterfront Chesapeake Bay residences on Willoughby Spit. It is claimed that WS appeared during an 18th Century storm and may someday disappear. I and WS did survive a Norfolk hurricane. My mother once visited and became somewhat alarmed as she noticed that each day of her visit the water got closer to the house. 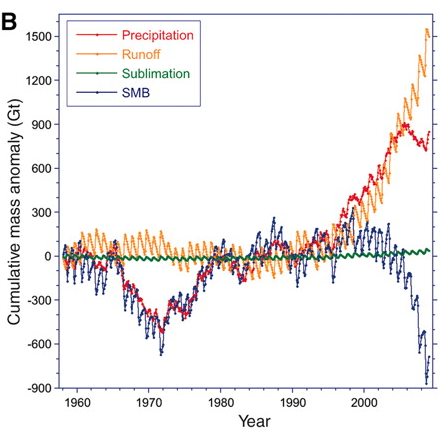 Don't forget that climate change driven flooding is also increasing due to larger rain events. One may attempt to protect low lying areas from the sea only to find that the water arrives from the sky and surrounding highlands. A few years ago my cellar would have been flooded in the recent New England storms due to the high tides covering the storm drain outlet pipes. Now there is a pumping station that empties the storm drains. Fortunately for this neighborhood, the problem became apparent and was remedied while the city was still able to fund such projects. Willoughby Spit took it hard during a Nor'easter last November. Here's one story and there's others on the google. And looking at the Sewell's Point history, since 1960, there's about 20cm more water for storms to kick around. I know it doesn't look all that drastic when you look at it from a Googlemaps perspective, but some things would be seriously impacted by just a 1-meter rise in sea level. All the loading/unloading cranes/infrastructure at major ports, the clearance height for boats under bridges, the sewer systems, etc. In NYC, for example, the subway system is already below the water table level, and only kept dry by a system of pumps running 24-7. If they were stopped, the entire system would flood in less than two days. Already, every time there's a nor'easter, there are serious disruptions in subway service. 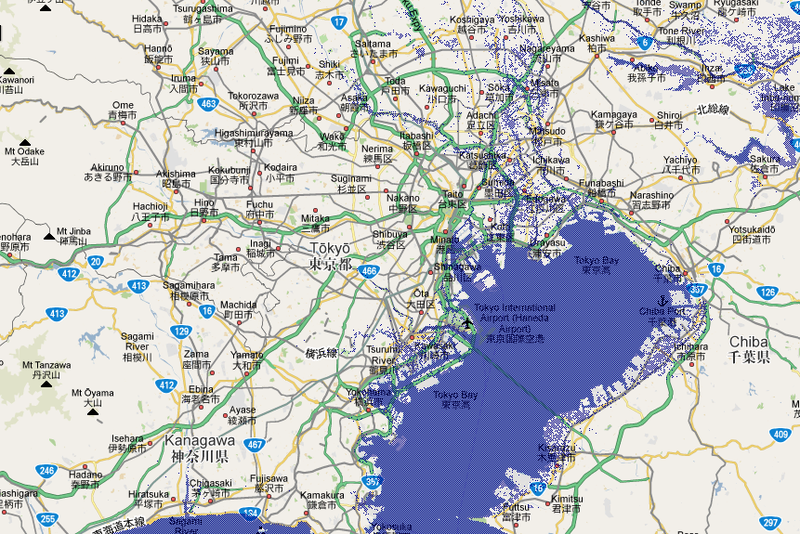 So just imagine what a 1-meter rise in sea level would entail. And try to imagine NYC being a viable place to live for so many millions, if it didn't have reliable public transport. Big coastal cities are going to be very different places. p-roc's mom - excellent points. These are in the general category I referred to above as "very painful regionally". I hadn't thought about bridges. In terms of the subways, etc - I think a lot of port cities are going to become more like New Orleans - there will be levees and pumps, and neither had better fail, ever. I am concerned about proposed new nuclear power stations in the UK which are to be at existing nuclear sites and all bar one at coastal sites. Dungeness, for instance, is on a shingle bank that has to be built up continuously now. With 2m sea level rise is becomes, almost, an island 4 miles out to sea. See:- http://flood.firetree.net/ . 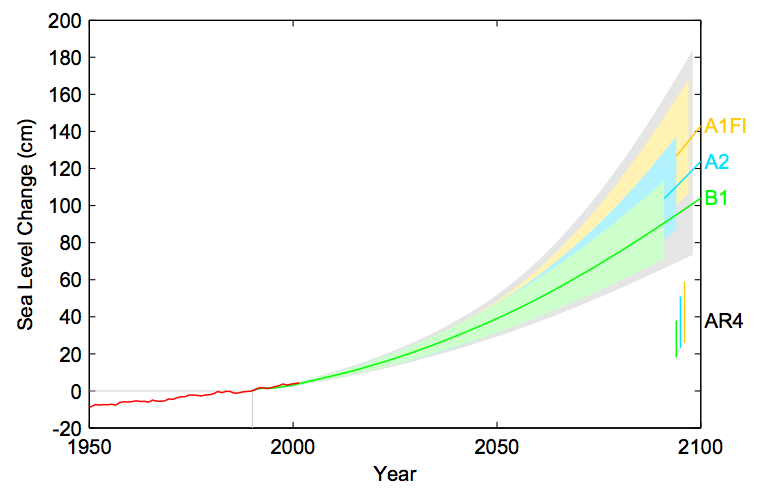 Two others are vulnerable to 3m sea level rise and three others become vulnerable at 4, 5 and 6 metres. The UK government is so concerned that the lights will go out when we lose 40% of our generating capacity over the next five to ten years that they are pushing these developments as hard as possible. 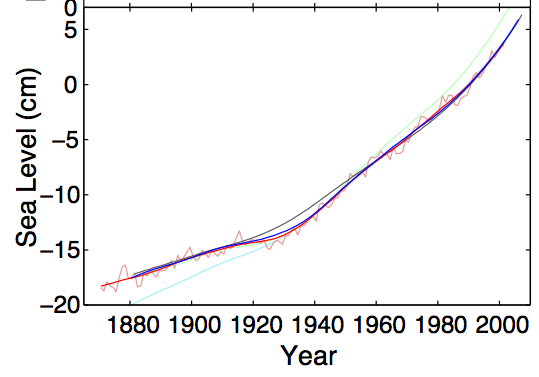 They are working on the IPCC prediction of .5m by the end of the century. As these power stations will be around for at least 120 years before they are decommissioned it is highly likely that one or more will be flooded before they can be made safe. As nature works exponentially rather than linearly it seems to be a criminal act to rely on the continuation of a linear increase in sea level rise in this case. Bill - yeah, it would be nice if that just turned out to be a particularly big fluctuation, wouldn't it - if it were to just turn around and go back the way it was. I can't say it really looks that way, but I sure hope it is. 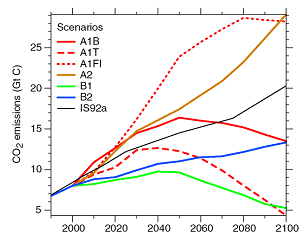 Can someone actually provide evidence as opposed to scary projections? When Does Surplus = Resilience? If 2005-2007 Wasn't Peak Oil, What Was It? What is Waxman-Markey Really Doing?